Top DVD Ripper for macOS Sierra/High Sierra to Rip DVD to MP4 AVI MKV ISO etc. 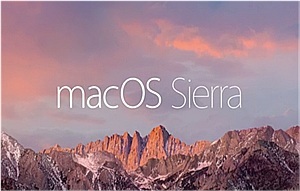 Since you are reading this page, congratulations, you may have upgraded to macOS High Sierra which, true to form, is the Apple's best-ever Mac OS. And you'll get what you are looking for, DVD ripper for Mac macOS Sierra or Mojave. Top macOS High Sierra DVD ripping software is shared here, with a rundown of all the highlights and (homemade & encrypted) DVD ripping on macOS High Sierra guidance included. You are free to copy DVD free on macOS to ISO Image, MP4, AVI, MOV, MKV, iPhone iPad Apple TV and more. 1. Rips DVD to MP4, MP3, AVI, FLV, WMV, MOV, ISO image, and other various digital video formats for different occasions, or copies DVD to iPhone, iPad, Android, Apple TV etc. with 370+ preset profiles. 2. 1:1 rips DVD with ZERO quality loss. The secret of the macOS DVD ripper original quality output lies in embedded High Quality Engine and Deinterlacing. 3. Copies DVD with No.1 fast speed - up to 320 FPS, thanks to QSV, Hyper Threading tech and multi-core CPU utility. 4. Auto gets around DVD copy protection, be it Region Code (1-6), Disney DRM, Sony ARccOS encryption, RCE, CSS, etc. The DVD ripper for macOS Sierra (High Sierra, Mojave or earler) is continuously updated to support users to decrypt and copy the latest DVDs with improved quality and speed. 5. Add support to copy any type of DVD, including unplayable damaged DVDs, TV series DVDs, 99-title DVDs, Japanese DVDs, workout/fitness DVDs, DVDs in non-UDF ISO 9660 file format that cannot be handled by other free DVD ripping program for macOS Sierra/Mojave like HandBrake. The DVD ripping software has well-organized interface and lets users even starters learn to copy DVD on macOS 10.12/13/14 for free with ease. The process will be smooth without freezing or stuttering. Go ahead. Download the best DVD ripper free here before you convert DVD on macOS Sierra based MacBook Pro/Air/iMac etc. Step 1: Run the macOS Sierra DVD ripper, click "Load DVD" icon on the top left to load DVD. Step 2: From the popping-up Output Profile window, choose an output profile. You can rip DVD to MP4, AVI, MOV, MKV, WMV etc. on Mac, convert DVD to iPhone, iPad, Samsung etc. mobile devices, and more. Four DVD Backup modes are available: The Main Title Content Copy allows to rip the main title of the movie on DVD, the correct title will be auto selected by the DVD converter for macOS Sierra. Full Title Copy rips the whole DVD info, Clone DVD to ISO Image is good for later burning DVD to DVD, and Backup full title to MKV. Step 3: Click "RUN" button to start free rip DVD on Macs running 10.12/13/14. 1. The "Safe Mode" can help the DVD decrypter for macOS Sierra bypass and rip copy-protected DVDs from Disney, Paramount successfully. 2. The "CPU Core Use" will speed up DVD ripping. Up to 8 core is supported. 3. Main Title Content Copy is the fastest DVD copy mode offered by the fast DVD ripper for macOS Sierra/High Sierra/Mojave. 4. The feature-rich DVD ripping software can compress DVD, trim DVD movie, crop, add subtitles and do other movie on DVD basic editing job. 5. We don't encourage you to copy protected DVDs you don't own for illegal use or commercial activity. After the tool finished the dvd copy process, you can move the DVD movies to iPhone iPad iOS mobile devices from computer to watch on the move without iTunes. MacX MediaTrans is a easy-to-use and fast file transfer for Mac. The iTunes alternative mac lets you transfer DVD movie copies that the DVD copy software for macOS Sierra gives to mobile devices iPhone iPad in No.1 fast speed by simply heading to "Video", "Add Video" and "Sync". Handbrake for macOS Sierra will be available soon if not now. As free open-source DVD ripping software for macOS Sierra, Handbrake does a good job in DVDs ripping. Most of the time, the output video quality is OK. Sometimes, this DVD ripper stutters and gives audio video not syncing problem, which is acceptable since we don't need to pay for it, right? 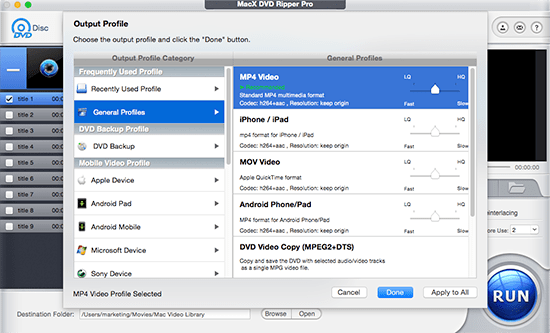 It is a bit complicated for beginners to learn how to use the free DVD ripper for macOS Sierra/Mojave, detailed guide is shared below. 1. Free download DVD decrypter for macOS Sierra and run it. 2. Select a source DVD disc by click "Source" button. It may take a while for it to load a DVD. 3. Click "Title" and choose a DVD title chapter from the dropping-up submenu to rip. 4. Choose Destination to save output DVD free copy. 5. Choose preset outputs on the right. The "Normal" and "High Profile" is good for output movie playback on media players, editing etc. 6. Choose video codec, frame rate, quality etc. to rip. Confused? Read best Handbrake settings to figure it out and copy DVD free with right settings. 7. Click "Start" to rip DVD with Handbrake. If you have two or more titles to rip, hit "Add to Queue" icon. Q: Unable to rip newly purchased DVD on Sierra with Handbrake. I've been having issues ripping some new DVD releases that I bought as the end result would make scratching high frequency sounds like the disk is severely scratched even though it's not. I want to transfer the DVD to tablet so I can watch it on the go. 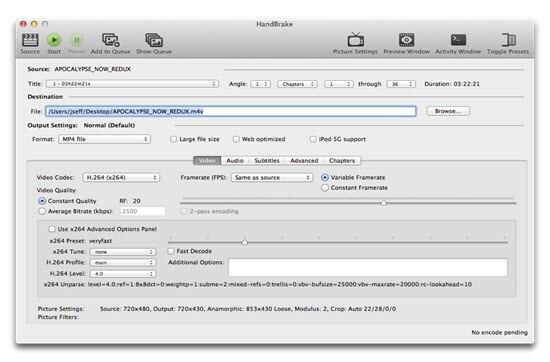 A: Handbrake is a good open source DVD ripper for macOS Sierra/Mojave, but it has its limits. Handbrake fails to copy newly released DVDs that comes with protection schemes. As I mentioned above, Handbrake will give error message like no valid source found, DVD not loading at the beginning, Handbrake showing 99 titles. And sometimes, it seems that Handbrake can copy the DVD to macOS Sierra/Mojave but it turns out to be a small unplayable clip with only a few KB. There's little you can do except to another DVD ripper to rip protected DVDs. Q: I always used Handbrake but it seems to not work so well anymore. It keeps making choppy video on output which it never used to do. A: There're two main reasons why Handbrake outputs choppy video/scrambled or broken up video when copying DVD to Mac, the first is that the DVD is encrypted, the other is that the Handbrake settings are not appropriate. If you are not sure how to do the settings, just keep it as original in Handbrake. Notice: We only list best DVD rippers that work on macOS 10.12, 10.13, 10.14. You need to know that the legality of ripping DVDs with DRM will vary based on your country of residenceto copy and we do not encourage any illegal reproduction or distribution of copyrighted content. Please abide by the local DVD copyright law before you rip DVDs with the above rippers. MacX DVD Ripper Pro is the best DVD ripper for macOS Sierra which can freely backup any DVD disc, ISO image, DVD folder on Mac (MacBook Air/Pro, iMac etc) in 1:1 quality to various video formats (MP4, MOV, MKV, AVI, FLV, etc) and portable devices with original quality.